I’m writing these words as I often do, using Microsoft Word. But I’m doing so on an iPad 2, not on a Mac. And I’m running Word for Windows on that iPad, thanks to the new OnLive Desktop client for the iPad. OnLive made its mark with a streaming service that allows almost anyone with broadband access—whether they’re on a Mac, PC or other platform—to play a wide array of PC games. OnLive’s servers do all the heavy processing—3D rendering and such—then stream the resulting video to client apps via a broadband link. If you can stream an interactive, high intensity PC game over the internet, why not stream productivity apps, too? That’s exactly what OnLive Desktop does. 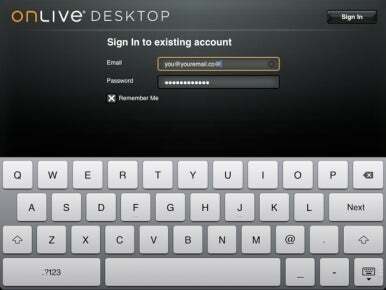 Before you can use the OnLive app, you need to set up an account at the OnLive website. If everything works as it should, you’ll next see a basic Windows desktop, a few key applications—Word, PowerPoint, Excel plus a few Microsoft touch apps—and very little else. More specifically, you’ll get the touch interface that Microsoft developed for its large, tabletop Surface system. 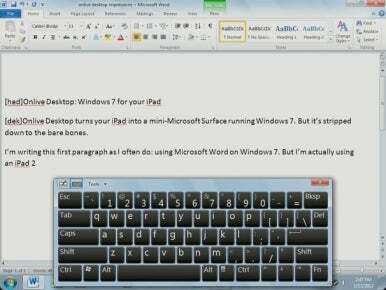 As you start to interact with that virtual Windows desktop, you’ll likely notice that you’re using a different keyboard; the standard iPad keyboard is not used. That’s one of many differences between the iOS and Windows 7 interfaces that iPad users will need to get used to. The Windows touch interface implements a bunch of extra doodads that Windows users love, such as the contextual (right-click) menu, which you access by holding your finger down on the tablet surface for several seconds. Other touch interface features work as expected: you can still swipe down to scroll through documents, pinch to shrink and so on. 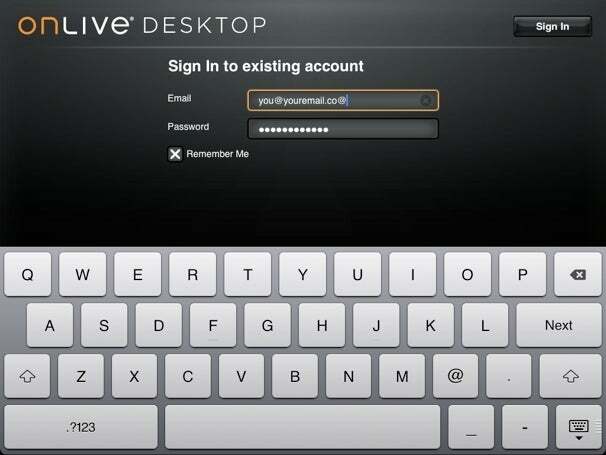 The OnLive app uses its own keyboard, not the iPad's standard keys. That said, Windows users will notice a lot of missing features; this is a very stripped-down version of the OS. You can’t access the Control Panel. It’s difficult to see how much storage space you have. (You get 2GB of online storage with your free account.) Common accessory applications, such as the task scheduler, are missing. You have no control over Windows, either. Any attempt to make any system level changes will get you nowhere. You can’t browse the Web—no browser, not even Internet Explorer, is included with the free client—and you can’t install any additional applications. 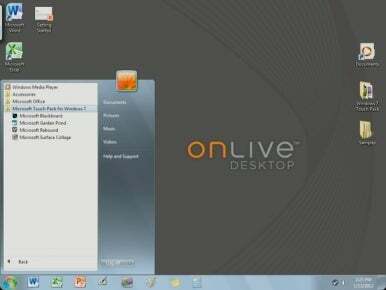 The Windows you get from OnLive Desktop is a stripped-down, but still functional, one. As noted, the free OnLive accounts gets you 2GB of online storage and access to those core Microsoft apps. If you want more options, you’ll need to pony up $10 a month for a Pro account. That gets you 50GB of cloud storage, Web browsing, and a limited ability to install additional PC applications. OnLive will also be offering enterprise versions of the service, which will include extra customization options for the end-user’s organization. Future options will include collaborative services, including desktop sharing (with chat). It may seem odd to collaborate on an Office project using an iPad, but it’s no odder than running what appears to be Windows on an iPad. If you work with Windows users, and want to use Windows-native apps to do so, OnLive Desktop could prove extremely useful. OnLive Desktop offers free or inexpensive access to Office apps, IE, and more on a tablet, but it suffers from design and usability flaws.